He recognizes the need for a big-picture approach to political challenges that includes a “Right to Vote Amendment” to the U.S. Constitution. Our democracy gains strength when more Americans participate in elections. But millions cannot vote today because of restrictive voting laws in some states—and President Trump has pledged to expand those laws nationwide. A constitutional amendment guaranteeing the right to vote would help stop this voter suppression. To that end, Ellison, Congressman Mark Pocan, D-Wisconsin, and Congressman John Lewis, D-Georgia, led two dozen House members this month in introducing the most powerful response to the ongoing assault on voting rights in states across the country: a constitutional amendment to explicitly guarantee the right to vote. 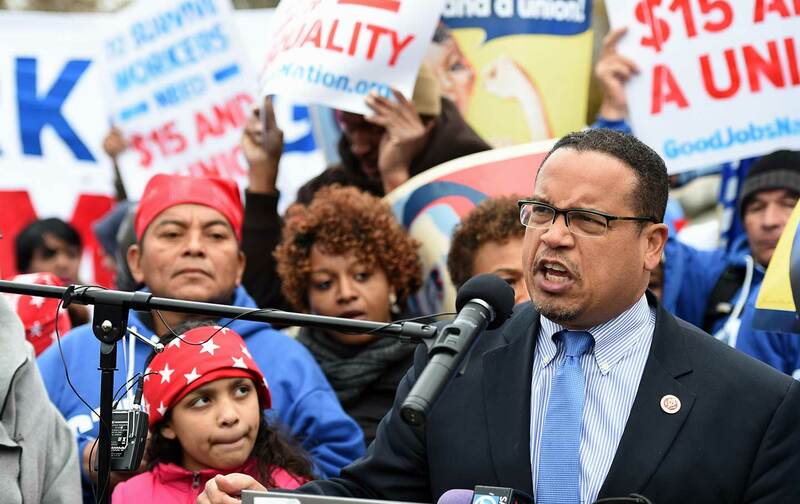 But Ellison also recognizes the need for a forward-looking, big-picture approach to political challenges. And he is willing—as the founders suggested would be necessary—to make constitutional reform a part of his advocacy and activism. That has excited supporters of his bid for the DNC chairmanship, which will be decided on Saturday, when 447 top Democrats from across the country gather in Atlanta to name new leaders. National Nurses United executive director RoseAnn DeMoro says it is Ellison’s ability to focus on the precise work of the moment while at the same time framing out a bold vision for the future that distinguishes him from the other able contenders in a DNC contest that also includes former Labor Secretary Tom Perez and South Bend Mayor Pete Buttigieg. “Selecting Keith Ellison to chair the DNC is exactly the direction the Democratic Party needs to go to rebuild and strengthen its ties with working class Americans, young people, communities of color, and the full diversity of the 99 percent of Americans who should be the base of the Democratic Party,” says DeMoro.